Wait, wait, wait. OMG!!! 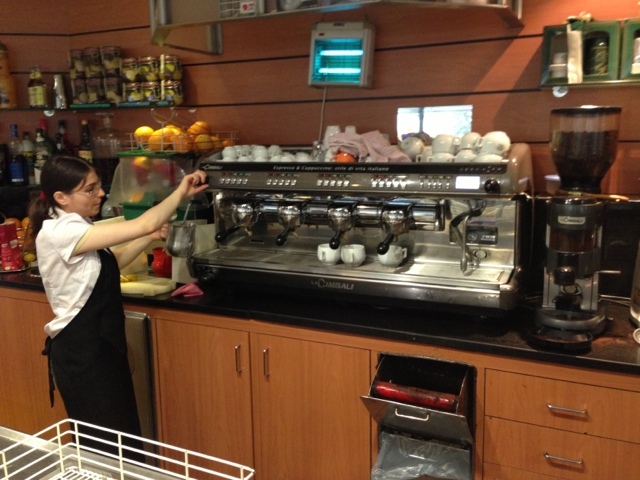 Before I tell you anything else - we just had Italian coffee - in Italy!!!! And it was freakin AWESOME!!! I'm totally coming back...oh, sweet baby Jesus (as in the one from Talledega Nights) I was in heaven - AND, get this...it was at a truck stop!!!!! Mind you, it was the flashest, Italianest truck stop I've ever been to. Get this: we rock up for petrol and a dude comes out to fill 'er up — as in a ridgy didge bona fide driveway attendant (!!) ...but wait, then he washes the windscreen, wipers up, with bubbles, and it's raining!! I nearly cried. Even writing about it now, there's a little tear welling up in my eye. So then, we go inside and, without a word of a lie, Pavarotti is playing, there is focaccia and Italian torte on display, the aroma of great coffee is filling my olfactory senses and there's a massive, massive machine with four grouppos hanging underneath. I didn't want to build it up too much but when I saw her tamp, twist and pour I nearly wept with excitement and anticipation. The crema flowed ever so slowly, dark at first, then frothy caramel love curled back upon the spout and softly trickled into the little warmed cup. And we stood there at the cafe bar, like proper Italians, and quietly went about drinking our coffee (oh except for the fact that occasional little squeaks of delight were escaping from me involuntarily). 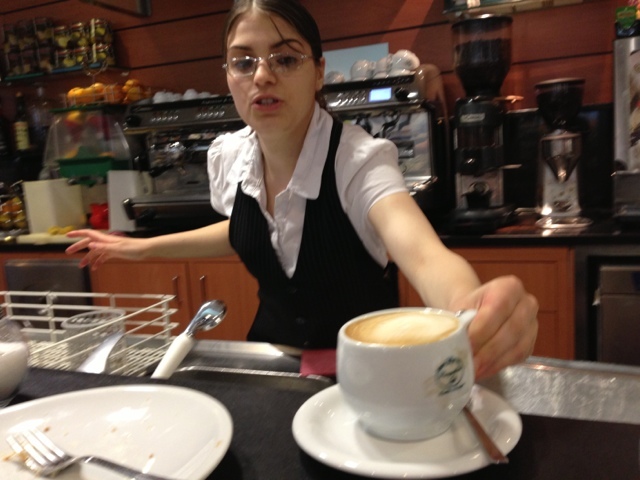 On the advice of our petrol attendant I went for the cappuccino. I was not disappointed. In fact, I nearly cried again as the flavour of joy danced upon my taste buds. 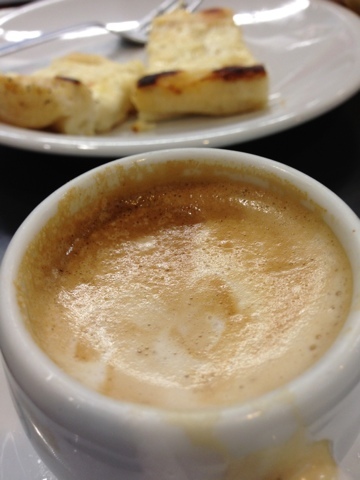 It was so smooth and delicious and the perfect temperature - mind you, I could tell that from the instant my fingers touched the cup. GOLD. It was so good that I had another very shortly thereafter. IN THE TRUCK STOP I tell you - we are coming back fo sho. Right then. Earlier that day...we smashed the hotel breaky and bolted for Alpe d'Huez at sparrows (well 9am!! ), looking forward to what could be the most explosive stage of the Tour yet. Now I must digress briefly to confess that I absolutely love small goods for breakfast. Why are we not doing that? 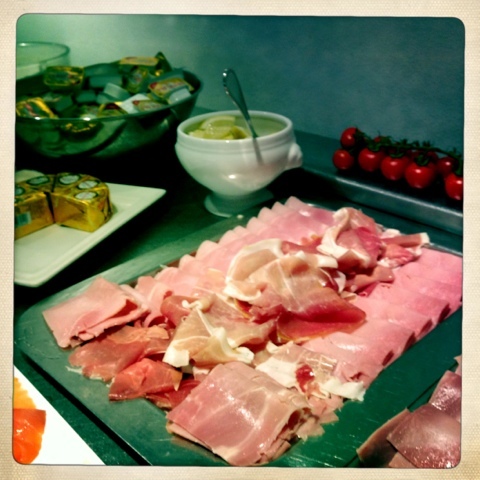 Prosciutto, jambon, salami, frommage of all shapes, sizes and tantalising smells...c'est magnifique and a particularly wonderful way to start the day. 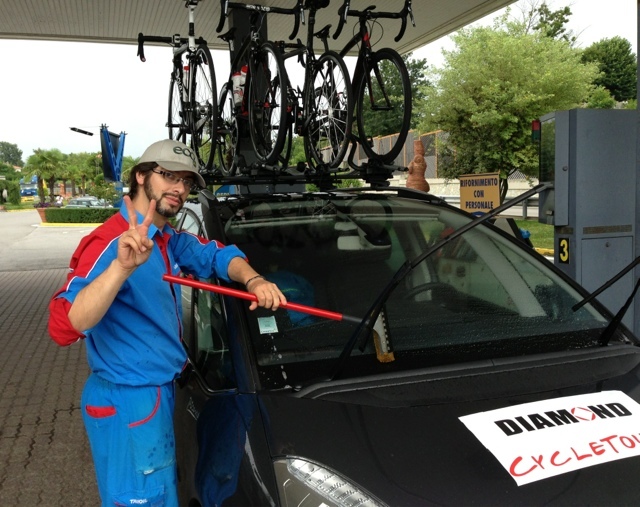 With the Diamond Tour officially over - me, Tony, On-ree and Tim piled into the van, bikes on the roof and set the GPS for le Bourg-d'Oisans. Sonia (the GPS chick) was obviously still exhausted from last night because she took us on a crappy 30 minute tour of Nice freeways past the same church three bloody times. Of course that's when we needed petrol and you've already read about that. These euro types really know how to tunnel. We went under the Poggio on our way back into France. The tunnels were the only relief from the pummeling rain. So the closer we got to this epic stage (and running nearly an hour behind schedule due to Sonia's unrequested Nice+ tour and our amazing coffee stop), the more we discussed paying off a live visit to Dutch corner and the more we considered the merits of a little French pub, a TV and beer. 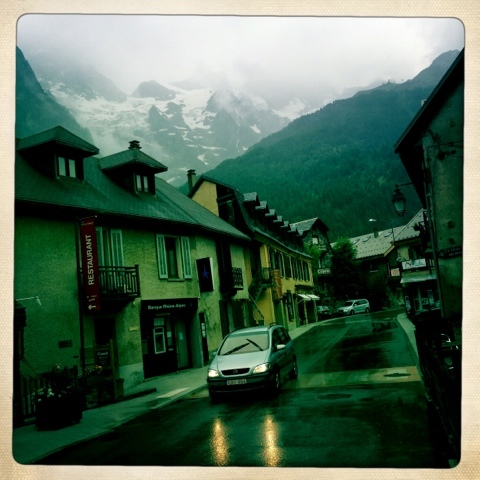 As we wound our way back up into the Alpes, the rain continued and the temperature dropped. The peleton was 15k from the base of the first ascent of Alpe d'Huez as we rolled into La Grave - about 15k from our anticipated intersection with the route. Text from T-Bird at home told us that the break away was just turning onto the climb. Would we? Wouldn't we? Unreplicable atmosphere and a fleeting glimpse as the pro's go past albeit with the chance of getting very wet and cold; or warmth, comprehensive race watching and beer? Tim spotted a large TV broadcasting the tour inside the La Grave pub as we drove past. It looked warm, dry, cosy and it had a large TV, beer and hot food...decision made. We parked the car and in we went - Hoegaarden, pizza, hot chips and Tour coverage. Under the circumstances, it was a great decision and we settled in to watch the fight. We were kinda rooting for TJ - I mean BMC needed something from this tour but it wasn't to be. In my opinion, ride of the day went to Ritchie Porte...legend. He marked the moves, he towed Froome, he protected on the sketchy, rough and damp descent, he went back to the car when his leader bonked, and he covered the gap to get back to him in order to tow Froome up the Alpe for the second time and the finish. Simply sensational. Outside the pub - 25k from the fireworks. On-ree had friends from Canberra on the hill and they were also our hosts for the night. Massive ups to Ben and crew for allowing us to crash with them in the most rustic and quaint ski lodge home in the tiny village of Le Pied du Col - that experience alone was an honour. We provided beaucoup wine and cheese as compensation! Unfortunately I couldn't get a shot of the outside because we got there after 11pm and left at 5.15am for me to catch the TGV to Paris. It was utterly charming. No riding today due to rain and not going up the Alpe to watch the Tour. Quite frankly, very happy with a rest day.